This ﬂuid is incompressible and possesses no viscosity. Such a ﬂuid is only an imaginary ﬂuid. All existing ﬂuids have some viscosity. A ﬂuid that possesses viscosity is known as a real ﬂuid. In actual practice, all ﬂuids are real ﬂuids. A real ﬂuid in which the shear stress is directly proportional to the rate of shear strain (or velocity gradient) is called Newtonian ﬂuid. A real ﬂuid in which the shear stress is not proportional to the rate of shear strain (or velocity gradient) is called non-Newtonian ﬂuid. 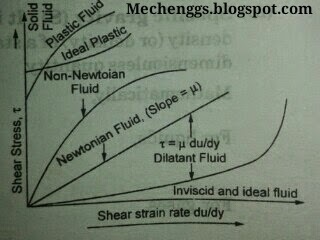 A ﬂuid in which the shear stress is more than the yield value and the shear stress is proportional to the rate of shear strain (or velocity gradient) is called ideal plastic fluid. CLASSIFICATION OF FLOWS ON THE BASIS OF MACH NUMBER.